Seoladh eagrán nua de Chaighdeán Oifigiúil na Gaeilge i dTeach Laighean tráthnóna. 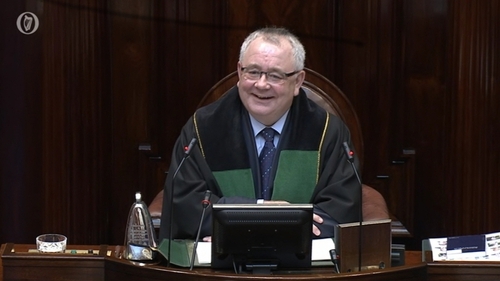 Ba é an Ceann Comhairle Seán Ó Fearghaíl a sheol an t-eagrán is deireanaí atá curtha i dtoll a chéile ag Rannóg an Aistriúcháin i dTithe an Oireachtais. Dúirt Vivian Uíbh Eachach ó Rannóg an Aistriúcháin go bhfuil trí athrú suntasach déanta san eagrán nua a bhaineann leis an alt, le huimhreacha agus leis an seimhiú agus claochluithe tosaigh. Maidir leis an alt, tá córas séimhithe Chúige Uladh, á aithint anois. Áirítear freisin an t-urú tar éis 'sa' agus 'don'. Ó thaobh na n-uimhreacha de, tá córas simplithe ann anois mar rogha sa chomhaireamh os cionn fiche.